If your hunting safety check starts at the crack of dawn, you’re too late. - DiVal Safety Equipment, Inc. - Welcome to the DiVal Dispatch - Your Source For Safety News & Updates! If your hunting safety check starts at the crack of dawn, you’re too late. Admit it, we take a lot for granted, whether you think you do or not. Car safety, home safety, expecting you will see your family or friends every day. The truth of the matter is we can really get out of control. We don't think about what our actions can do. We don't think about how crazy doing something unsafe for a second can lead to a lifetime of regret. Admit it, subconsciously you just simply want to live life on the edge. As we move through the end of summer I can't help but be reminded of how silly people can be. Head shaking and confusion sets in when I see the number of hunters that are killed every year. Why? The sport is dangerous don't get me wrong however there are so many ways to leave for the hunt and come back unscathed. Too often I hear of hunters that drink the night before till 1 or 2 in the morning only to wake up in a couple hours suffering from a hangover. Tired, nauseated maybe even still drunk as they stumble into the darkness with one thing in mind, "get the prize." That prize being a deer, turkey, bear etc. Now the general public when asked if they know what the number one killer of hunters is the most common answer is always guns. When you really dive into it though slips, trips and falls account for the number one factor. Bad lighting, bad mindset, poor training and not enough sleep. Now I want to caution my readers and say that not all hunters are drinkers and dare devils, however if some that think they are being safe, aren't. Today I want to provide some hunting safety tips that not only can save your life but get you home with a smile, even if you don't get the prize. Prepare the day before. This includes mental clarity and physical preparedness. Have a point person. A wife, husband or friend that knows where you will be and times. Check in frequently at predetermined times. 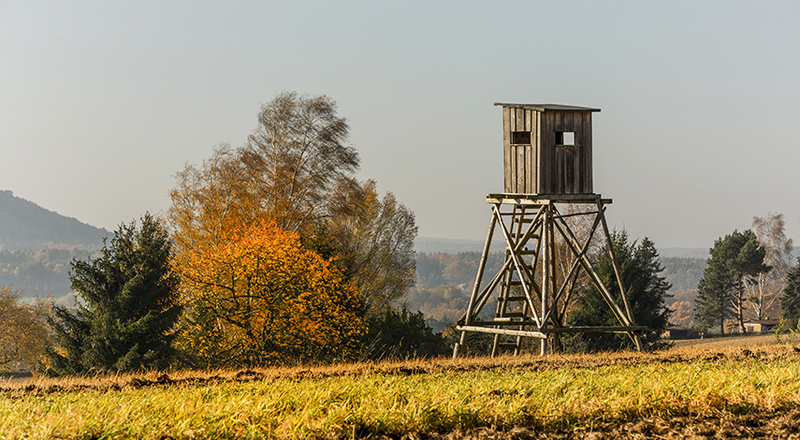 Know the law when it comes to hunting. Things like keeping a loaded shot gun or an unlocked firearm in your vehicle is grounds for some serious legal ramifications. Have a second set of clothes that are weather related to the season. This includes boots and socks. Hey, Lieutenant Dan said it right "keep your feet dry!" Scope out your hunting area before the hunt. Know the lay of the land and any dangers you might come across. This also includes getting permission from the land owner in advance. Maintain your tree stand! If the last time you used your tree stand was the last year you used it, it's time for new straps and a full inspection. This includes inspecting the tree. A lot can happen in a year. Have water and something to snack on with you. You never know when you might need it. And no, a beer does not fall into this category. First aid kit in the pouch is a must. This should include an emergency blanket. Have a set of binoculars. At the crack of dawn a full inspection of your area should be done to see if any other hunters may be in your area. Hi viz, hi viz, hi viz. I can't repeat it enough. Deer are color blind and could care less if you're wearing orange or mossy oak. You will though if another hunter mistakes you for a prize. I am sure as you read this you may have some additional tips that you have learned over the years. Don't be afraid to message us with your helpful ideas. Maybe you will be a part of a future article! Until then, there is a saying in the safety world. "An accident may have brought you into this world. Don't let one take you out!" Till next time, I'm Alex Nobles.